This drama has quickly gained a lot of praise from critics and viewers alike, based on an homonymous novel written by Gillian Flynn, (who is also the author of Gone Girl) back in 2006, has already six episodes aired on HBO from a total of eight, with some media outlets saying it is Amy Adams’s best performance to date, and also one of the best miniseries produced in recent years. Those two affirmations should be enough to rethink if we are in front of a new mainstream, probably self-proclaimed show; but it is not, it’s a remarkable, well directed and scripted TV series that surpasses itself with every episode and has truly outstanding performances from all the actors involved. The story centers on Camille Preaker, (played by Adams), a journalist who returns to her normally quiet and little known hometown in Wind Gap, Missouri to investigate the second case of a missing schoolgirl who, eventually, ends up brutally murdered and the killer is yet to be found, but interestingly enough, as the series advances, it makes you realize it could be anyone from the community, given their disturbing background on unsolved crimes and how toxic all the relationships in there really are. At times you can get your own guesses on who is going to be the next suspect, or who may be the killer, but the show is good at deceiving too. 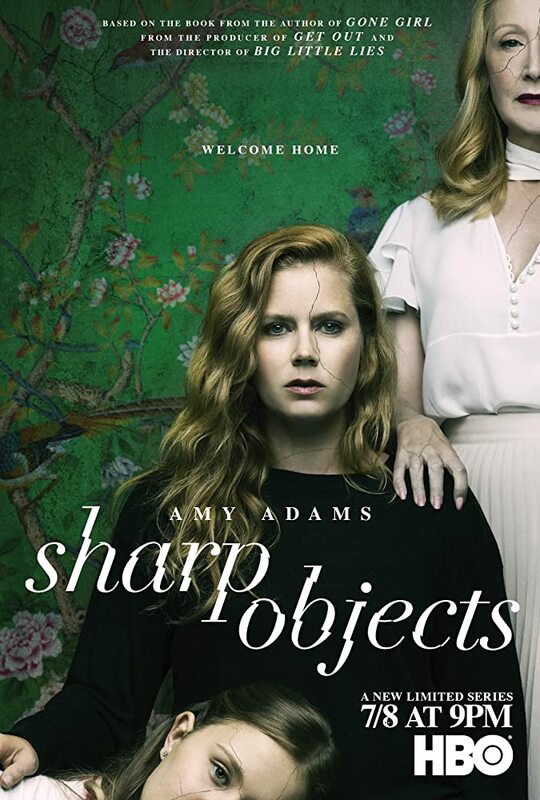 Beyond that, Sharp Objects is not a police/detective series, but more about the internal, and sometimes more external, struggle Camille has to relive for coming back to places and people she once left “for good”, from memories of her sister’s passing, not to mention the difficult relationship with her estranged mother Adora, and her unnerving exchanges with little sister Amma, every different encounter and decoding from what lies inside Camille’s mind sets viewers into a mood. An example of this is how with every episode the opening sequence has a different song or melody. The series has an excellent composition. Something that has fascinated me about the script is the use of text to anticipate a reaction, being the main character’s hallucinations or actual signs and repetitive sequences involving different places and objects, flashbacks from Camille’s troubled childhood and teenage years, her interactions with people she already knew but cut all contact with, all this situations slowly put together the puzzle of what actually happened to her years ago and how it turned her into the adult she is today. This is probably not a series to watch if you are going through any of the things Camille is shown to be going through, or get triggered by its raw portrayal of self-harm, alcoholism and suicidal thoughts, but is this same rawness of exposing human nature as it really is without judging, but actually seeing it from the point of view of the one who lives with these issues what may raise the flags necessary to know if someone you know needs help. Another entry in the ever-expanding Marvel TV Universe, this time with the police-turned into brutal vigilante Frank Castle. It looks like Marvel decided not to keep launching Mr. Castle to the big screen, due to the unfortunate box office performance and critical failure of the two motion pictures and decided a more cautious approach to a TV series, a safer ground. We still believe that the 1989 version of the film with Lundgren has more merits than its later reboots. The Emoji Movie is a film produced by Sony Pictures Animation and distributed by Columbia Pictures. Directed by Tony Leondis, it is a popular adaptation based on emojis for the application we use in mobile messages. The film has become infamous for the harsh criticism it has received, and is currently considered one of the worst films of all time. Emoji: the film was nominated for 4 Razzie awards, of which it won all of them; including worst movie, worst director, worst couple, and worst script, making it the first animated film to be nominated and win those awards. Vikings is a television series co-produced between Canada and Ireland, created by Michael Hirst for the television channel The History Channel, which tells the adventures of Ragnar Lothbrok, the greatest hero of his time. The series tells the sagas of the Viking band of the Ragnar brothers and their family, when he rises to become the king of the Viking tribes. Not alone is one of the brave warriors, Ragnar usually embodies the Nordic traditions of devotion to the famous gods; the legend says that he was a direct descendant of god Odin, the god of war and warriors.